Electronic Arts and Lucasfilm announced today an updated global publishing agreement for the highly anticipated massively multiplayer online videogame Star Wars: The Old Republic. With this new agreement, certain publishing, marketing and distribution responsibilities previously designated to LucasArts will shift to EA, so that all publishing, marketing and distribution responsibilities can be centralized for efficiency. Lucasfilm will continue serving as a key partner, collaborating on design and marketing, and as a licensor of the property. Star Wars: The Old Republic is one of the most highly-anticipated videogames of 2011. 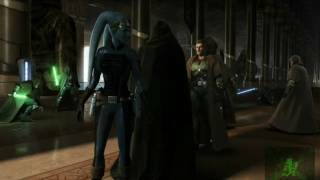 In the game, players will explore an age thousands of years before the rise of Darth Vader when war between the Old Republic and the Sith Empire divides the galaxy. Players choose to play as Jedi, Sith, or a variety of other classic Star Wars roles, defining their personal story and determining their path down the light or dark side of the Force. Along the way, players will befriend companions who will fight at their side or possibly betray them, based on the players’ actions. Players can also choose to team up with friends to battle enemies and overcome incredible challenges using dynamic Star Wars combat. Star Wars: The Old Republic is coming to PC in 2011.